When French engineer Andre Meulnart invented the Mepps spinner in 1938, he knew he was inventing a lure completely different than any other fishing lure. Years before, James Heddon had carved his first lure from a stick. It was a crude representation of a bait fish, but, crude as it was, many game fish, especially bass, found it irresistible. The Mepps spinner, however, imitated nothing. Mr. Meulnart knew that. 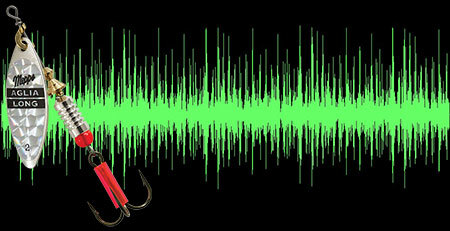 His lure was not an imitator, his lure was an enticer. He was convinced the spinning blade would attract fish. He also thought the spinning blade looked like a butterfly, so he called it the Aglia. Aglia is Latin for butterfly. Almost four generations later, the Mepps Aglia is still catching fish for anglers worldwide. Spinners work on flash and vibration... a flash that is visible and a vibration that is audible. Fish do not live in a silent world, just ask any diver. 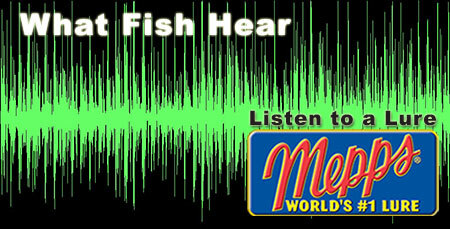 Underwater creatures are constantly bombarded with all kinds of sounds. 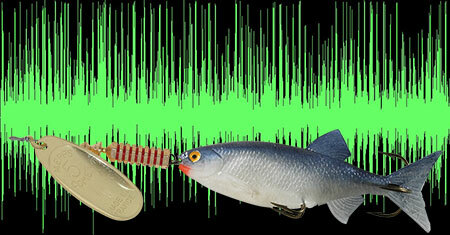 Many of these sounds are produced by prey, while others may be produced by predators. Some, like the sound of a pump or turbine are produced by man. 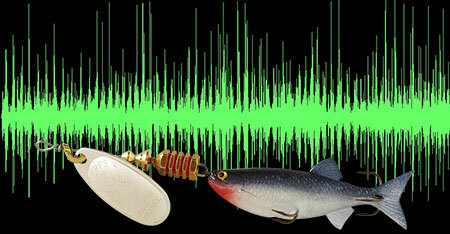 To hear how your Mepps spinner sounds as it's being pulled through the water click on the lure’s soundwave image. Mepps Ultra Lites are the smallest spinners we make. Because they weigh only 1/18 oz., their small blade has to work hard to produce a sound. None-the-less, they do produce a light "flapping" sound during the retrieve, a sound much like the flap of a bug's wings. Is this what it sounds like to the fish? 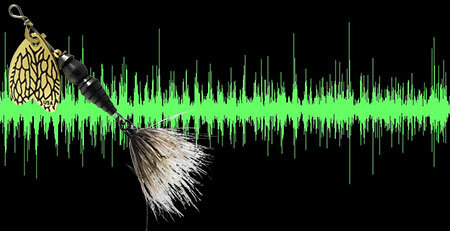 We can't answer that, but we do know if the fish misses the flash of the small blade, it's unlikely it will ignore the sound of this tiny spinner. The Mepps Aglia Long features a willow leaf blade that "hugs" the body of the spinner allowing it to run deeper than most other spinners. Because the blade is long and narrow and it spins close to the body of the spinner, the Aglia Long does not produce a heavy "thump." Instead, it produced a muted "chug" during the retrieve. The Mepps Giant Killer features the heaviest willow leaf blade we offer. It sounds like an old steam locomotive as it is being pulled through the water. If you listen carefully you realize the smaller #2 Aglia Long blade produces a sound very similar to the Giant Killer blade, but, it is much more muted. The Mepps Aglia blade is the original French style spinner blade. The Mepps Spin Fly features a #0 Aglia blade which is just one size up from our Ultra Lite blade. This blade flares outward from the spinner's body as it is retrieved. The blade angle produces a steady, high-pitched flapping sound with a light buzz. The buzz gives this blade its own unique sound. The Mepps Aglia is the classic Mepps spinner. Living up to its name, the Aglia blade has a classic steady beat as it is retrieved. In fact, a musician can count its quick beat... 1-2-3-4, 1-2-3-4. It's both lively and bright. Because the French blade on the Aglia spins at a steady 60° angle from the spinner's body, its sound is also steady and very easy to hear. For years, the #5 French blade was the largest blade in the Mepps Aglia series. Today, the Mepps Magnum Musky Killer features a #7 Aglia blade. Listening to these two blades under water is like watching a defensive lineman running along side of an offensive lineman. The sound of the #5 Aglia blade is steady and deep with a rapid repetitive thump. 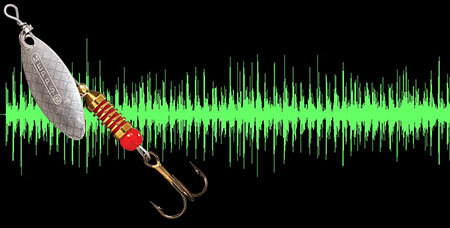 The Magnum Musky Killer blade sounds similar, but, the thump is deeper and slower. Both sound like a slow moving locomotive, and both are very easy to hear underwater. The #3 Mepps Comet Mino blade produces a sound similar to the #3 Aglia blade with a couple of exceptions. Because the Comet blade spins closer to the body of the spinner, the Comet blade produces a sound with a slightly lower pitch than the Aglia blade. The Comet blade also spins just a bit faster than the Aglia blade, so the steady series of "thumps" the blade produces during the retrieve are closer together. The sounds these blades produce are similar, but, by listening to one right after the other you will hear a definite difference. The #5 Mepps Comet Mino blade produces a sound similar to the #5 Aglia blade. However, because the Comet blade spins closer to the body of the spinner, its sound is pitched lower than the Aglia blade. The Comet blade also spins just a little bit faster than the Aglia blade, so the steady series of "thumps" the blade produces during the retrieve are closer together. These blades may produce similar sounds, but, listen carefully and you will have no problem hearing a definite difference. The Magnum Musky Killer features a #7 French (Aglia) blade, the largest French blade of any Mepps lure. Comparing these two blades under water is like watching a defensive lineman running along side of an offensive lineman. The sound of the #5 Aglia blade is steady and deep with a rapid repetitive "thump." The Magnum Musky Killer blade sounds similar, but, the "thump" is deeper and slower, very much like a slow-moving locomotive. This is a sound that can be heard a long way underwater. The #5 Colorado blade on the Mepps Marabou produces a very definite "thump" as it's pulled though the water. In addition, its pitch is higher than any other blade we tested in its size-class. This is understandable, however, as the Colorado blade spins further out from the body of the spinner than any other blade Mepps uses. This is a blade that definitely can be heard. It's no wonder the Mepps Marabou, with its pulsating marabou tail that comes alive with every revolution of the blade, is a favorite of trophy fishermen everywhere. The #7 Colorado blade on the Musky Marabou produces a hard audible "thump" as it's pulled though the water. In addition, this Colorado blade produces a pitch higher than any other blade we tested in its size-class. This is understandable, considering the Colorado blade spins further out from the body of the spinner than any other blade Mepps uses. Also this blade weighs 8.5 grams. making it just a little lighter than either the #7 Aglia blade used on the Mepps Magnum Musky Killer, or the #6 Aglia Long blade on the Mepps Giant Killer. Both these blades weigh 10 grams. Because the Colorado blade is slightly lighter and it spins out and away from the Musky Marabou's body, this lure can be retrieved at a medium to high speed, bulged just under the surface or burned over the top of weeds. 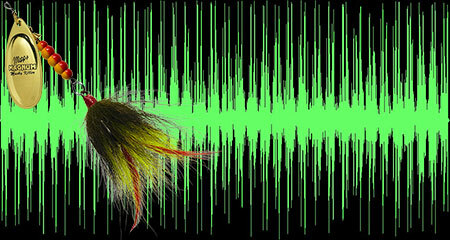 It's no wonder the Musky Marabou, with its pulsating marabou tail, is a favorite of trophy bass, pike and musky fishermen worldwide. When Mepps developed the Thunder Bug it was introduced as the first and only spinner that allowed fishermen to "Match the Hatch." Not only is its blade shaped like a bug's wing, it is veined like the wing of a bug. Its body is segmented like the body of a bug. These lures also come in color patterns imitating insects. In fact, they look so much like insects we've given them bug names, everything from grasshopper to white miller to stone fly. . . nine different patterns, too, will match the hatch. However, what we didn't know until now is a spinning Thunder Bug blade SOUNDS like a bug. 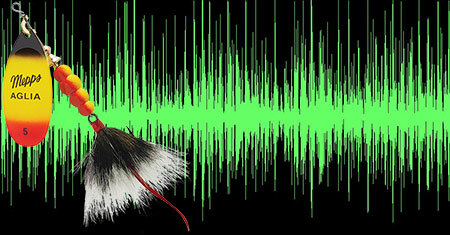 That's right, a Thunder Bug pulled through the water produces a sound very similar to small rapidly flapping wings. 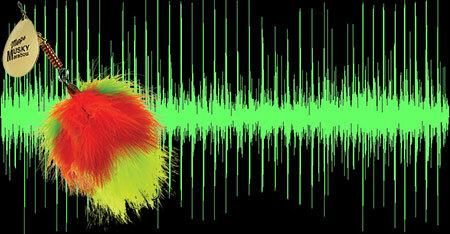 We also discovered, if we increased the speed of this file about 3 times and raised its pitch, the sound became a buzz. While this is hardly a scientific study with any definite conclusions, listening to this enhanced file can be fun. 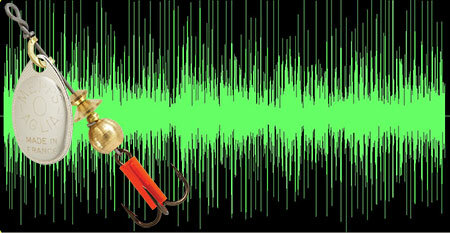 The Mepps XD produces a rapid "thump" at the beginning of the retrieve, but, that "thump" slows down to a steady beat as the XD's fulcrum bead evens out the rotation of the blade. 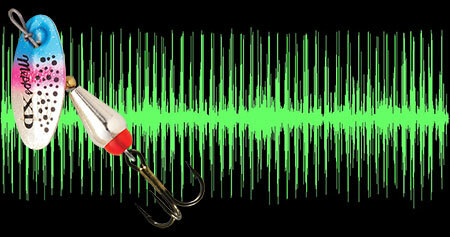 This style spinner can be unusually loud depending on the speed of the retrieve, but, they run deep making the XD a favorite of trout anglers who fish fast, deep streams. Because the XD is a shaft-through-the-blade spinner, it's difficult to compare the sound of its blade with traditional Mepps in-line spinners. In-line spinners use a clevis to attach the blade to the spinner shaft, so a comparison would be apples-to-oranges.